Ultra thin VELCRO® brand hook&loop tape double sided Widths: 3/4'', 1", & 1 1/2"
HOTFIX RHINESTONES HEAT TRANSFER Iron on "Rock and Roll Guitar Pink Patch"
katarra8 has no other items for sale. 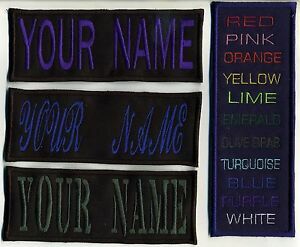 Details about 5" x 14" Extra Large Custom Name Tag Patch with a HOOK backing - "YOUR NAME"
$0.25 shipping for each additional eligible item you buy from katarra8, when you use the cart to make your purchase. Thank you for your order. PLEASE let me know what NAME you would like me to embroider for you. I must hear from you within 24 hours or I will use your last name. NOTE: There is NO tracking information for First Class / Airmail shipments. Tracking is provided for Express Mail only. For Priority or Express Mail Service, for a flat shipping fee, you may order as much as can fit in a 9" x 12" envelope! Any customs duties are the responsibility of the recipient.